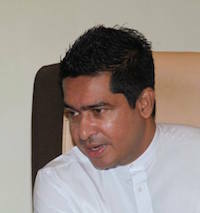 State Minister of International Trade Sujeewa Senasinghe in attempting to explain communications with Arjun Aloysius, the man who is at the centre of the Central Bank bond scam, implicated himself by saying that these calls were to obtain information for a book he was writing on the issue. Senasinghe’s book was published in July 2015, a year before he was appointed to the Committee on Public Enterprises (COPE) of the 8th Parliament, established on May 6, 2016. Senasinghe replaced MP Velu Kumar who resigned on July 7, 2016. It has been revealed that Aloysius has spoken with Senasinghe on no less than 62 occasions between May 6, 2016 and October 28, 2016 (36 incoming calls and 26 outgoing calls), while he sat in the COPE committee in which he insisted there was no wrong doing. Clearly none of these 62 calls, which the Bond commission is concerned could be related to ‘research’ for the book that Senasinghe authored.